A mostly tongue in cheek, deeply sarcastic look at truly gifted bloggers/writers of gingerism. To stumble upon any number of sources that highlight some of the more highly enlightening threads of those bloggers that voice anti-redhead prejudice that makes this country (Australia) and other countries great. 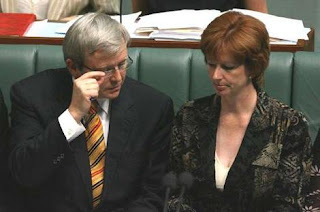 Above: Australian Prime Minister, Kevin Rudd & Deputy-Prime Minister, Julia Gillard. NOTES: Kevin Rudd is the Australian Prime Minister. The redhead the 'enlightened ones' refer to is Julia Gillard, Deputy-Prime Minister and Federal Minister For Education. Ooh fair shake o' the sauce bottle there mate. It's just so...whiny and annoying! He sounds like he is reading off a piece of paper and talks down to us like we are school children. Why do we keep getting nerdy prime ministers?l.....Whats's next? There is no way in hell I'm having a filthy ranga as a prime minister. She's actually a natural blonde. So she went from blonde to red by choice? That's even worse. ps - whats the dealio with rangas dying their hair black? its not half obvious from their invisible eyelashes and eyebrows that they arent naturally raven-haired. Hey i used to die my hair firetruck red. I look banging with red hair...it's only jelousy because you guys cant handle the gingery power. Here ends the first of many enlightening threads. All but 'random-blackness' are clearly enlightened beings, worthy of our respect. ...someones gotta help them keep their hands of their o' sauce bottle's there mate! Will Julia Gillard play the 'ginger' card and will she ever be Prime Minister? Well, you could argue that technically she already has been to date... as the 'Acting-Prime Minister' while Rudds away. Above: Garrett as the front man for Australian rock group 'Midnight Oil'. NOTES: Peter Garrett is the former front man of 'Midnight Oil' and the current Federal Environment Minister. 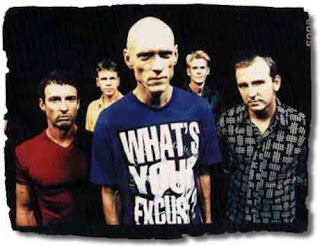 According to long-suppressed video evidence, Peter Garrett is some kind of ginger mutant. Check that buzz-cut bloodnut! Peter commenced total hair removal soon afterwards, for obvious reasons (although possibly the redness is due to lighting; we need hair-colour confirmation from Garrett’s office). Note also, around the 2:49 mark, that Labor’s future environment minister appears to briefly consider an air-guitar solo - before reverting to an early form of his trademark “dancing”, which at this stage (1977) resembled a cross between an awkwardly tall girl’s skip-rope attempts and someone playing table tennis with both hands. Here ends the second enlightening thread. So there you go... Not just! 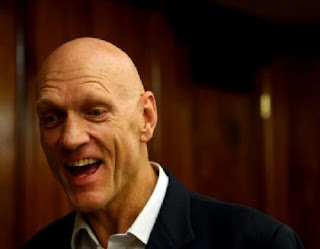 Peter Garrett the highly successful singer/songwriter or Australian Federal MP, but also the the possible 'ginger mutant' and 'buzz-cut blood nut'. Final Thought For Thread No. 43. Its interesting how the gingerism really stops after a person leaves high school. The pig ignorant seem unaware that there are such things as mascara and eyebrow dye and eye pencils so that natural blondes can make their facial hair darker. Just as dark women bleach facial hair and have to remove dark moustaches, hairy legs etc., 90% of women dye their hair 90% of the time even if its to dye it their own natural colour to hide the grey. Dying your hair from choice is surely different than feeling it necessary, however much you like your hair, to escape mega putdowns. What say you Nate? Kelsey dyed hers but still died - what, if anything does that tell us about the effects of discrimination, prejudice, bullying, bigotry? I'm not sure 'enlightening threads' didn't leave me further in the dark ages of humankind. As I'm currently being a 'blackhead' with make-up & artifice I find no difficulty looking like a common c*nt. Most women do it most of the time how hard could it be. Hey, there's nothing wrong with a 'blackhead' or a 'common c*nt' as YOU put it... just as there is nothing wrong with red hair. Your descriptions of non-redheaded people are inflamatory,un-necessary. I HONESTLY think its a shame you no longer want to post/blog on gingerism.com. However, equally I don't agree with 60% of what you say, 70% of the way you write it, 100% of the ranting content and assumptions you make are painful to read and I don't like the way you rarely reference anything. You may or may not feel crappy about my writing... but it wont make me stop writing. Your entitled to your opinion, but when you put it out there, you need to be prepared to take the fair or unfair criticism. I have to say that the non-referencing in your posts/blogs adds to the reason it appears that all you do is rant. Purely opinion pieces are ok every once and a while (like one a month), but not nearly every time. When you reply to a post/blog don't make another post/blog entry. Break up your long responses into separate comment boxes... Its hard for me to follow. There are many readers of gingerism.com and they are unlikely to make the connection from post/blog article to post/blog article either. This type of format for comment responses adds to you sounding like your ranting. If you HONESTLY need a rest from the critical and not so critical feedback, the fair and unfair feedback and the constant differing opinion then I'm glad you've decided to stop. Hope its just a rest. I'll get on top of the hair dye poll asap. Nate why are you so critical of anyone else's blogs yet obvious from your defensive responses of your blogs find it so hard to take honest criticism yourself. Simply which ginger died and made you 'ginger' god? Defending or clarifying my position to critics does not make me a god. You seem confused 'thread troll'. I am a redhead who has felt prejudice and discrimination. I fight for myself. I am also a democratically participating citizen and teacher who is attempting to fights against the redhead prejudice faced by many in high school who need advocacy. The abuse I have personally suffered as a redhead adult is why I write, research and attempt to make my voice heard. In making my voice heard many write of similar experiences and I keep a record for anytime anybody wants to refute any of the statements I make. I do not claim to, nor have I ever claimed to speak for ALL redheads, that would be gingerist. The posts on this blog spot document and comment on the mainstream discrimination and prejudice of redheads. I comment on what I have taken the time to research and find in the media both broadcast and new. You don't like the way I do it then blog yourself... You'll be providing a different and hence worthwhile take on gingerism... I ain't going to stop. I am not the only person who blogs on this site and some of their views 'don't align with' mine. I have the right to criticise accordingly. Disagreeing with another persons opinion is not as an insult. Giving opinion on someone else opinion is not an insult. You can choose to participate and I would encourage you to keep your participation constructive. I wonder if your aware of the definition of a "thread troll" google it. I wonder if you are? Tanarus certainly proved you don't! Understand the definition of a troll!